BFC Boys Soccer defeats Summit 7-1 on Senior Night. Boys Soccer defeated Summit last night 7-1. Quinlan Grobbel and Matt Koleba continued their strong season on the offensive end as Quin had 4 goals and Matt 2. James Doyle had the other goal. Nick Lucido stood on his head in goal in the win. Tyler Carman had a beautiful save of his own as he headed out a shot that was deflected. Nick Fooy had 2 assists in the win. The defense was stellar in the match as they held a very explosive offense in check. The team honored the seniors prior to the game. Matt Koleba, Michael Galbenski, Andrew Dixon, Nicolas Fooy, Ryan Auerbach, Chandler Glowicki, Tyler Carman, Jad Abou Zaki, and Sheldon Shi. 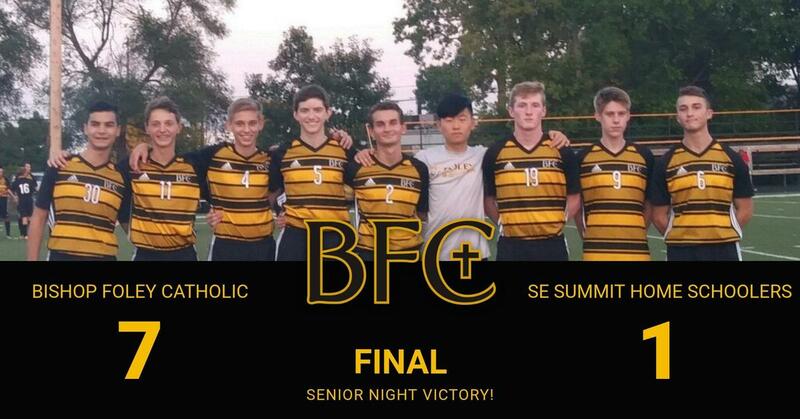 We thank the seniors for all of their contributions to the school and the soccer program.